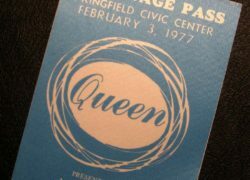 Item description: Queen Backstage Pass for the 3rd February 1977 gig at the Springfield Civic Centre, Massachusetts, USA. The pass in light blue screen print on white silk. 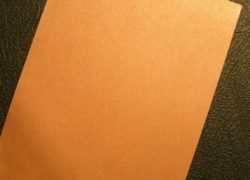 Reverse with brown split & peel backing. Condition report: Mint condition. Storage age only. Backing intact. 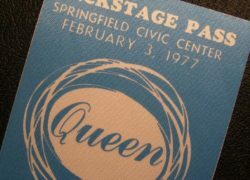 Background to Queen’s 1977 Tour: Queen’s The A Day at the Races Tour supported their late 1976 album A Day at the Races. This tour was the first to use the song “Somebody to Love” and many others. “Brighton Rock” and “Bohemian Rhapsody” were performed in full for the first time. Also, singer Freddie Mercury performed a vocal canon to segue between “White Man” and “The Prophet’s Song”. The opening act on most of the North American leg was Thin Lizzy. In New York City, the concert at Madison Square Garden was sold out within moments of tickets going on sale. The final two shows on the tour at Earls Court was filmed and is widely traded among fans. These shows were of note as the band used an expensive lighting rig in the shape of a crown for the very first time. Both shows were also officially recorded on video and the first show was also released on many bootlegs in good quality.